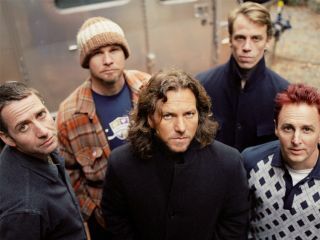 Pearl Jam, Soundgarden and one-time Smashing Pumpkins drummer Matt Cameron has finished the debut album for jazz inspired side-project Harrybu McCage. The jazz trio also features serial-session-keyboardist Ryan Burns and bassist Geoff Harper of Herbie Hancock, Bill Frisell fame. The 10-track self-titled album is a mixture of original compositions and covers including five interpretations of pieces by pianist Thelonious Monk and one of Funkadelic's Alice In My Fantasies. Despite Cameron being no stranger to vocals on previous occasions, Harrybu McCage is all-instrumental. Before you recoil at the thought of a jazz/grunge mutation, and as any Soundgarden or Pearl Jam fan will tell you, Matt Cameron's penchant for songwriting goes far beyond that of a your average stick-wielder. As well as writing credits on Soundgarden's Superunknown and Badmotorfinger LPs, you'll find a gushing remark from Pearl Jam's Eddie Vedder on the band's Lost Dogs compilation sleeve notes: "Matt writes songs and we run to find step stools in order to reach his level - what comes naturally to him leaves us with our heads cocked like the confused dogs that we are". We're not sure whether jazz purists will like it. MusicRadar's resident Miles Davis fan was unavailable to comment.